Moving time: 4 hr 38 min. Weather: 68°F in the morning with a high dew point; got up to 90°F by noon. Partly cloudy all day. The sun was just screaming down in the afternoon. Last night's heavy rain cooled things off but meant that I had to pack my tent wet. The cassette I had put on the bike yesterday is working out well. I had to make a few small cable length adjustments to get it just right so that it shifts smoothly but now it works as smoothly as the old one. I did a short day today after doing more than 70 miles per day for six of the last nine days. 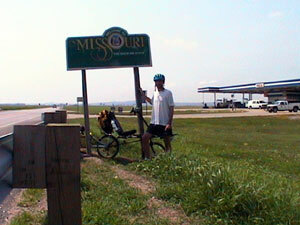 It was my intention to make it to Farmington, Missouri today, a total of 83 miles, but I didn't eat as much as I should have this morning and the sun got to be too much to take. I got a late start at 8:00am which didn't help either. Tomorrow I'll start much earlier. I hope I can keep up my 62 mile daily goal during these hot times. This was the flattest day since the third day of riding in the Virginia Piedmont. I only did an average of 38.2 feet of climbing per mile of riding, thanks mostly to the Mississippi river levee for about ten miles. The day I rode from Virginia into Kentucky was the steepest day with 94.1 feet of climbing per mile of riding. The weather forecast looks very bad for the next week or so. It's supposed to be very hot and sunny for the next eight days or so. I'm going to have to ride in the morning, at night and drink lots of water. I hope I can keep my mileage up. 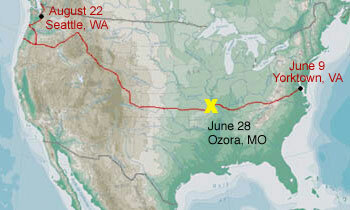 Right now it looks like I won't hit Kansas until July 3 or 4 - that's two days behind my most ambitious riding goal. Much of the riding was along the Mississippi river levee which is far more impressive and substantial than the levee we have in my hometown of Lock Haven, Pennsylvania. The flood plain is extremely wide and they work very hard to keep water off the fields. There are large diesel and electric pumps that move water from the inland farms to the other side of the levee into the river. Some were running today after last night's rain. 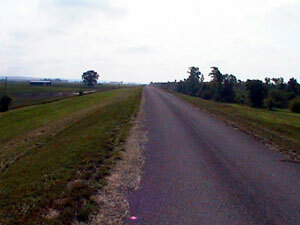 The first picture a view along the road that runs on top of the levee. 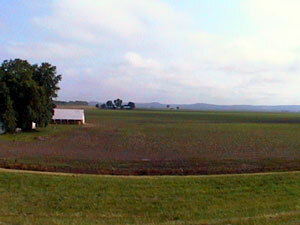 The second picture is of a farm along the river. I hit some more neat milestones today. 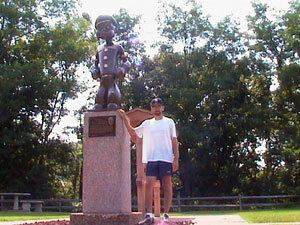 I rode into Chester, Illinois - the home of Popeye. The creator of the Popeye cartoon was born here and the town has gone Popeye crazy. Many businesses have "Popeye" in their name, the water tower has a large cartoon of Popeye on it and there are pictures of Popeye everywhere. The first picture is of me entering town and the second is at the Popeye statue at a small park just before the interstate bridge. 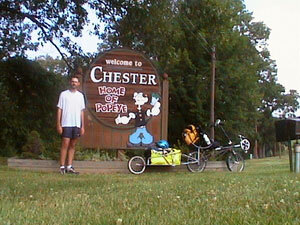 Chester was supposed to be an all service town but there were no services along the route except for a small gas station. It was also a horrible climb up into town and then a steep drop back to the river again. I should have followed the truck route signs that ran along the river. The town sits on a 300 foot bluff above the river but I didn't get much of a view from up there. It is good to be out of Illinois and off their bad roads. So far Missouri's roads are much better. My fourth state in the journey! I suppose I can say that I'm in the west now that I'm west of the Mississippi. Riding over the Mississippi river was a little harrowing. The bridge is only two lanes wide, there is heavy traffic and no shoulder at all. The north side of the bridge sports a very narrow walkway that's about 24 inches wide and 18 inches above the road surface. I elected to walk my bike over the bridge rather than ride it and block traffic. The bridge is nearly one mile long and it took some patience on my part and on the part of the drivers for me to make it the whole way. I stopped at the gas station in the background the picture to the right and talked with the people working there for a while. They told me of a group of 30 college students who were through here on Monday (four days ago) and were heading to San Francisco to raise money for their college. He wasn't sure where they were from or where the started. I have a feeling they didn't start in Yorktown because I haven't heard of them yet. Perhaps I'll catch up to them in the next week or two. My palm pilot gave out on me today. The batteries went dead and I had to reset the memory to make it work. I backed it up before I left but have all that data on my computer at home. That's bad news because it has all sorts of good information on it that I need like phone numbers, my return flight information, mail drop box contents and other things that I need. I'm just going to sent it home because it's useless now. Although I'm as far south as ever, people here in Missouri talk normally. They don't have that Deliverance accent that Kentucky people have. It's almost like a dialect switch gets hit at the Mississippi river. I don't feel like I'm in a foreign country any more. My day ended in Ozora, Missouri where there's a nice, cheap hotel at a truck stop. I've grown to love truck stops because they have everything - many cheap restaurants (some with buffets), laundromats and other services. I'll dry out my tent and ground cloth, recharge my computer and digital video camera, take my clothes to the laundromat and eat like a pig. There's a 24 hour buffet restaurant that's pretty cheap here. I ate my second dinner there for $6.99 and I'll go there for breakfast tomorrow before leaving. I have the Ozarks to look forward to in the next few days then the Flint Hills and plains in Kansas. I'm really looking forward to the Rockies. Other cyclists say that the grades aren't bad and the views are great.